Well, that will go down as one of the twistiest episodes of television in quite some time. 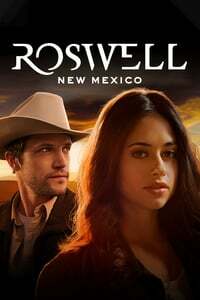 Roswell, New Mexico Season 1 Episode 5 brought us new layers to the mystery and set us on a different path as we approach the second half of Roswell, New Mexico Season 1. In “Don’t Speak,” we learned who really killed Rosa Ortecho and went deep on the alien conspiracy, with Grant Green revealing that he has video evidence of aliens and that he’s paid to spread gobbledygook. Adding Wyatt Long to the mystery keeps things helpfully tight for this already-large ensemble cast. His role attacking Liz and killing Green solidifies that all the town bigots also hate aliens and go to disturbing lengths to carry out their mission, cementing the parallels between aliens and marginalized humans. Last week I went on about the original Roswell, and I'm sorry if I poisoned the discussion. So I'll lay off of that. Anyway, I'm enjoying this teen-drama-grows-up, which I guess is just ... a drama? Small celebrations for actually referencing local features: reading over the rough transcript for the episode, I see that someone said that Isobel's car was picked up "on 285," which is US-285, a local highway. And reading Delia Harrington's review gave me pause: "In “Don’t Speak,” we learned who really killed Rosa Ortecho" -- but did we? Max and Michael are kind of cagey about that around Isobel. Michael made the three girls float out of the old turquoise mine "because his hand was broken," and maybe Iz killed them? Because her hand was the right size? I ... dunno. I'm hopeful that Isobel was the one who was secretly dating Rosa. And maybe got her mind wiped by the fourth alien? I've liked Kyle pretty well so far, but he was kind of a jerk to Alex, even in the present day. I mean Alex talks about being abused and in response he gets told how brave he is? That's not even close to being at question. Like, what does that have to do with having a safe space? And Max is just over the top with how this unrequited/never went anywhere love from high school was the only thing that ever made him happy? Really? Now I want them to get together and then fall horribly apart, because once they get to know each other, they realize they aren't actually compatible. It's a knee-jerk response.